From the moment you step through the doors into our spiegeltent you will be transported into another world where performers break free from the confines of the stage and the action unfolds all around you. No two performances are alike as the wall between artist and audience disappears. A few guests may be invited to participate, many will enjoy table-side interaction with artists, and everyone will share in being a part of a one-of-a-kind celebratory event creating a memorable evening for all. 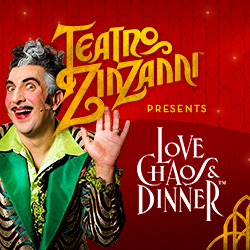 If you have never been to Teatro ZinZanni and want to learn more, please contact our box office at 1-877-424-2421. Pricing varies depending on seating section, day of week, and capacity already sold for the performance. Your ticket price includes the 3-hour show experience and accompanying 4-course meal. On the night of the show, you will be responsible for an $8 per person base meal gratuity for the service of the meal as well as any food upgrades and/or drinks you decide to purchase. You may make your reservations online at any time, 24 hours a day. Valid forms of payment for online reservations are Visa, Mastercard, Discover, and American Express. Seating is pre-assigned by the maitre d’ prior to your arrival at the spiegeltent. Get to know other Teatro ZinZanni guests, as you may be sharing your table with at least one other party. *Wheelchair and other accessibility requests can be accommodated. Please call our box office prior to your show night to ensure your needs can be met.